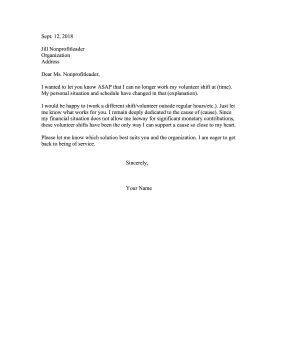 When you’re no longer able to work a particular volunteer shift, this letter can be sent to nonprofit leaders along with an offer to volunteer in another manner. I wanted to let you know ASAP that I can no longer work my volunteer shift at (time). My personal situation and schedule have changed in that (explanation). I would be happy to (work a different shift/volunteer outside regular hours/etc.). Just let me know what works for you. I remain deeply dedicated to the cause of (cause). Since my financial situation does not allow me leeway for significant monetary contributions, these volunteer shifts have been the only way I can support a cause so close to my heart. Please let me know which solution best suits you and the organization. I am eager to get back to being of service.